A host of tube worms was discovered off the coast of New Zealand in one of the largest deep-sea methane seeps in the world. Cosmos magazine online quoted that “These newly discovered seeps lie along the continental slopes to the east of New Zealand’s North Island, at depths of between 750 and 1,050 metres. One of the sites covers about 180,000 square metres, making it one of the largest cold seeps in the world. Since sunlight does not penetrate to the ocean floor, there are no photosynthetic organisms at the seeps. Instead, animals of the seeps survive by eating microbes that consume methane and convert it into sustenance, in a process called chemosynthesis. “The seeps off New Zealand are … remarkable in the sheer extent of their chemosynthetic communities,” said Baco-Taylor. Her team towed sampling equipment over the vents and took video footage of the cold seep animals. 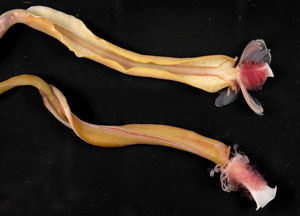 “It is possible that the large and obvious tube worms, and possibly two or three species of the clams could be species new to science,” said Ashley Rowden, from the National Institute of Water and Atmospheric Research in Wellington, New Zealand. The cold seep communities included corals, white bacterial mats, sponges and extensive beds of clams and mussels. The team reported seeing 40 centimetre long tube worms emerging from beneath rocks, and another type of tube worm which was gutless and relied on symbiotic bacteria for nutrition. “Despite the geographic isolation of the New Zealand seeps, we do expect that the assemblage [of animals] will exhibit some degree of similarity with seep assemblages found elsewhere, and possibly even possess types of fauna found at other chemosynthetic ecosystems, such as hydrothermal vents,” said Rowden. The expedition also examined the floor of a canyon off the South Island where sunken driftwood and whale carcasses could support chemosynthetic life. The researchers found a mass of giant worms, burrowing sea cucumbers and sea urchins, and enormous tube-building foraminifera (single-celled organisms). Little of the region had been previously explored, so almost any sampling of the fauna was likely to find animals new to science, said Rowden. This entry was posted on Saturday, November 25th, 2006 at 12:01 pm	and is filed under Interesting Stuff. You can leave a response, or trackback from your own site.